Rise and shine, Berlin! After a busy first day, the startups arrived this morning ready to rock and roll with morning code drops from our offshore developers. 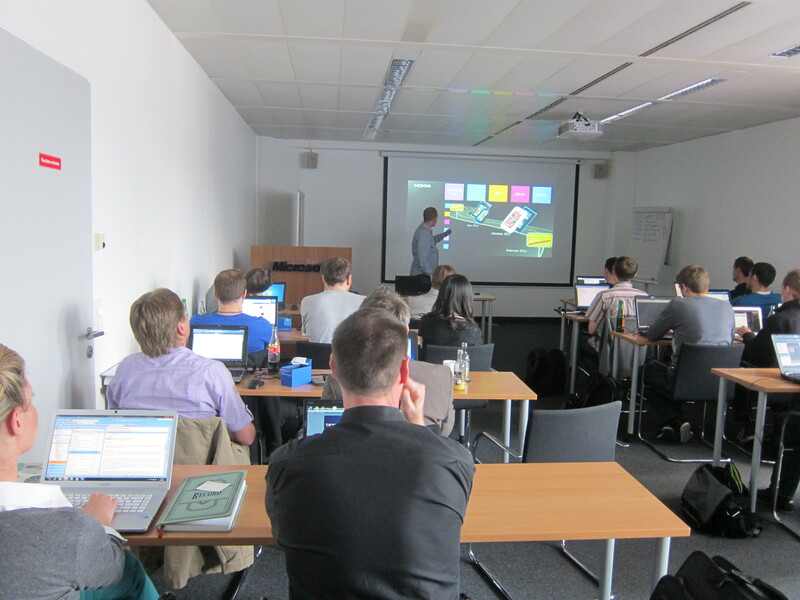 Many participants have commented on the great location of this week’s MAW events held at Microsoft’s Berlin offices. The building is right across the street from the famous Berlin Zoo, which has provided some great background noise throughout the event. There was some early excitement today as several of our startups and MAW were featured in the Huffington Post— yet some more much deserved media coverage for MAW! The morning started with some more unstructured development time for the companies. Even after a long night of work last night, the developers were eager to get back to work this morning. Following the development time, the content section of the day began. 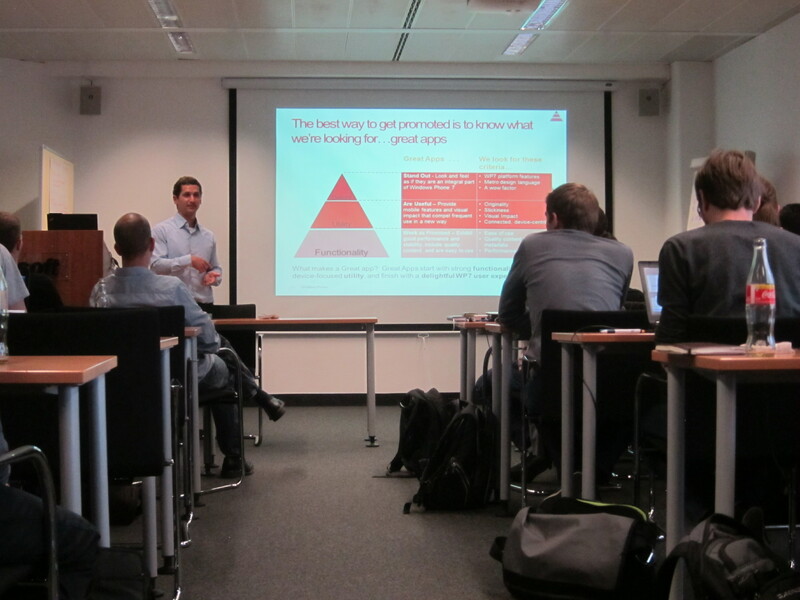 Oliver Scheer, Microsoft Deutschland GmbH, kicked off the day with a presentation on UI/UX and mobile development. This lecture has been a staple at the past events, and always proves to be useful for the attendees. Following the presentation, the companies attended a networking lunch with developers, Nokia, and Nokia Growth Partners. This was a great opportunity for the startups to make contacts and discuss their app development progress. On the heels of a successful lunch, Christian Schepke, Manager of Ecosystem and Developer Experience at Nokia, took the stage. Christian presented on partnership opportunities with Nokia and shared some numbers about Nokia’s shipments and momentum with Windows Phone. Christian then handed over the microphone to Walter Masalin, Nokia Growth Partners’ Berlin office. Walter presented on the VC firm and how to structure a funding pitch. Brian Hoskins, Strategic adn Emerging Business Team at Microsoft, then discussed the availability of application development grants from Microsoft and Nokia’s joint fund with Aalto University. Brian then took the stage for a presentation on Marketplace and Monetization. This session is another staple at MAW events, and one that participants always find useful for how to think about launching their applications. Brian discussed ways to increase downloads and user engagement with the unique capabilities of Windows Phone, including App Connect, Live Tiles and Marketplace merchandising. He also shared the top six ways to increase monetization on the platform, as well as the key ways to build a great application and what the Marketplace team looks for to feature an app. The content part of the day finished off with a Q&A session on technical and business questions for the startups. 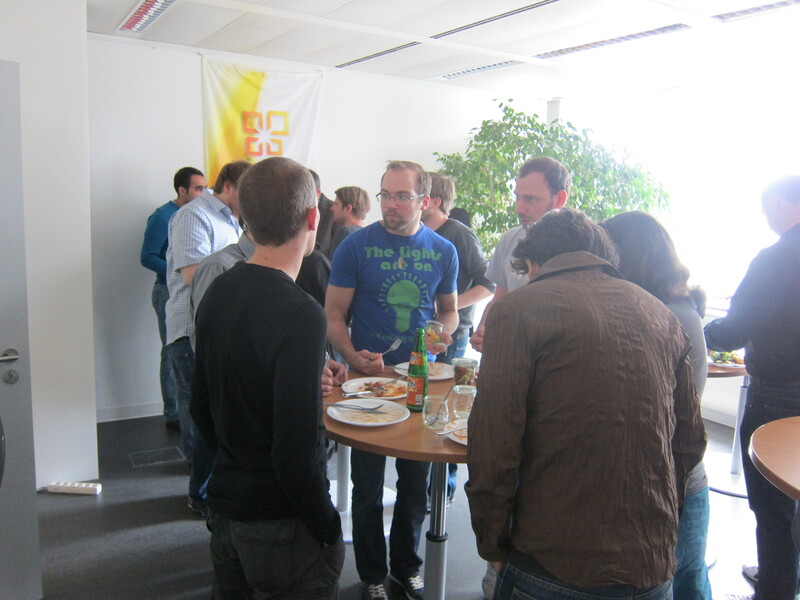 The day concluded with a pizza dinner as startups continued into the night working on their apps. Many have already developed working beta versions in just two days, which means demo day will be another exciting one. Tomorrow promises to be another busy day with PR and Marketing training, partner showcase with dailyme.tv, as well as the MAW networking dinner.